HAS GAY RIGHTS BEEN IGNORED FROM THE DEMOCRATS????? Why have we not revisited this issue of GAY marriages? It seem like the topic of discussion is Healthcare, Iraq, National Security that people would like to know about. But in fact there are several issues that have been visited at the beginning of these debates but have obviously been blanketed from the glitz and glamour of the political games. Early on there were so many views discussed but have we lost the focus of what the American people really want. What happen to the GAY RIGHT ACTIVIST? Atlanta men and would that represent this community should be more appalled then I am because I don’t wish to partake in that activity but this needs to be ONE NATION, ONE AMERICA. If you ever felt you were discriminated against for your race, religious faith, TAKE A STAND AND BE COUNTED IN THIS NEXT ELECTION. IT WILL BE A CHANGE. 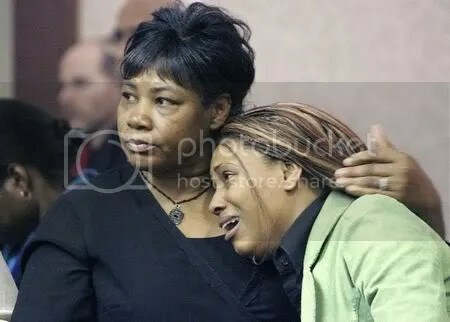 Cincinnati Minister imprisoned for molestation…..
Kristolyn Curtis (right), daughter of Bruce Curtis, pastor of Community Friendship Church, reacts with her mother (left) as Judge Keith Spaeth announced the prison sentence. A sad story out of my home town of Cincinnati, Ohio –a pastor was convicted of molesting a teen girl. A crowd of about 50 congregation members and relatives packed a Butler County courtroom and spilled out into the hallway as the pastor of a Hamilton church was sent to prison for 15 months for molesting a Fairfield teen. The Rev. Bruce Curtis, 54, of Community Friendship Church was convicted last month of attempted sexual battery and sexual imposition involving the 17-year-old girl that he was counseling. You are currently browsing the archives for the Random News category.